Who Is Gaming Bloomberg.com to Keep Bullish Articles “Most Popular” ? 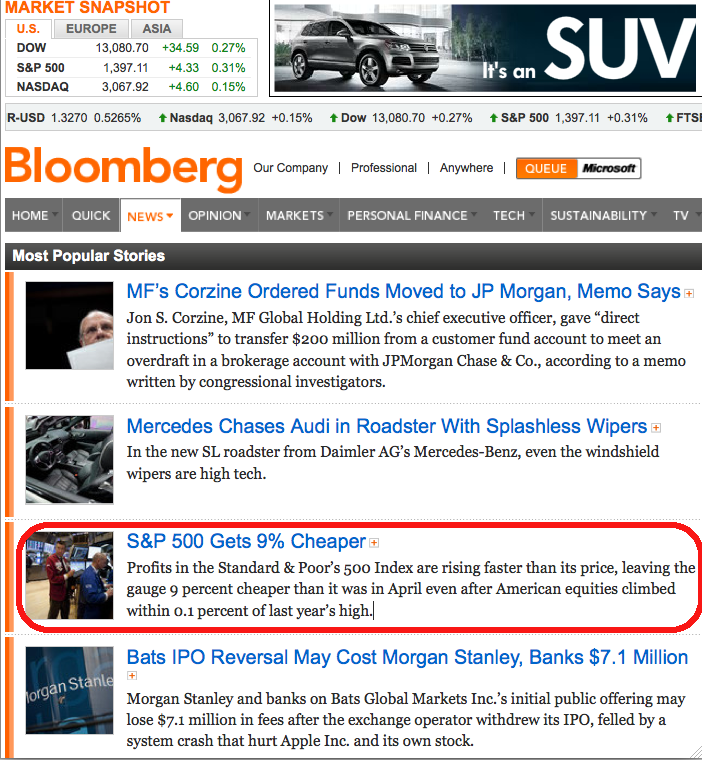 About a month ago, I included this Bloomberg article — S&P 500 Gets 9% Cheaper — in a linkfest. Normally, something I cull off Bloomberg’s most popular list slips off after a day or two. But yesterday marked a full month that this has remained on the top of the Most Popular list. As you can see from the graphic below, its #3 — a month after its Feb 23, 2012 4:39 PM publication list. Which makes me ask the question: Why? Its not a bad article — in fact, its pretty good. But 31 days later still in the top 5? Bloomberg publishes 1000s of pieces a day — i have never seen any of their columns stay most popular for 1/10 as long. I suspect someone is gaming the Most Popular list — www.bloomberg.com/popular/ Its costs next to nothing to have a script keep loading that story, artificially keeping its traffic number up at the top of the list. I bet if Bloomberg;’s IT folk do a server log review, they will see lots of questionable traffic, including lots of page reloads, rand0om and fake URLs from .RU and elsewhere.